Newcastle United manager Alan Pardew has praised the performance of Gael Bigirimana after a Premier League debut in Sunday's 1-1 draw with Aston Villa. The 18-year-old came on to replace the injured Danny Simpson, and impressed in central midfield on only his 30th professional appearance. 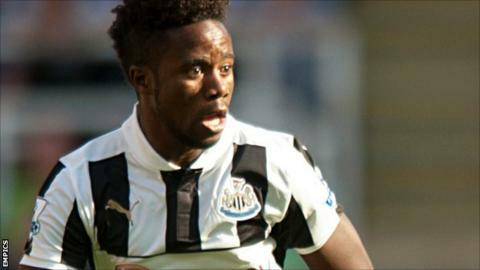 "He's 18, it's his first top-flight game, we weren't playing well, I took a gamble," Pardew told BBC Newcastle. "But he's paid me back because he was as good as anybody on the pitch." Signed from Coventry during the summer, the Burundi-born player had made one previous appearance for the Magpies - against Atromitos in the Europa League. Meanwhile Bigirimana's introduction late in the first-half saw Netherlands international Vurnon Anita moved to right-back, as Pardew reshuffled the line-up. "We brought Vurnon in purely because he is so versatile," Pardew added. "He went to right-back, he's comfortable there, he got two great headers and some of his forward passing took us up another notch." Simpson's hamstring problem follows injuries to Ryan Taylor and James Perch, although midfielder Chieck Tiote could return to the squad after the international break. Pardew continued: "We're hoping to have Chieck back for the Everton game. "I think we're missing him, we're missing his drive and everything about him. "He's a big player for us and we're looking forward to getting him back in a black and white shirt."